(Bloomberg) -- When it comes to Brexit, U.K. stocks have gone from dejection to hope, and back to dejection again. Domestic names recovered earlier this year as investors drawn to their cheap valuations also judged the risk of a no-deal Brexit to be receding. Recently, they’ve taken a beating again, as the proposed deal’s third failure fueled growing confusion over the country’s political and economic outlook even as data remained resilient. And now, another cliffhanger: Prime Minister Theresa May has asked the European Union to delay Brexit until June 30, a request that not all EU members are keen to approve. While a no-deal divorce is still a fringe case for markets, it remains the default outcome, if neither an extension nor May’s deal is passed. That’s the risk facing investors, seven days before the country’s scheduled departure. “The key for U.K. domestic stocks could be the restarting of delayed domestic investment -- but that will only happen once there is more certainty over the U.K.’s future economic relationship with Europe,” said Edmund Shing, head of equity and derivative strategy at BNP Paribas SA in London. While a delay lowers the risk of a no-deal Brexit, that’s not enough to boost long-term confidence, he added. For investors, the question has always been whether the U.K. represents value -- or a value trap. 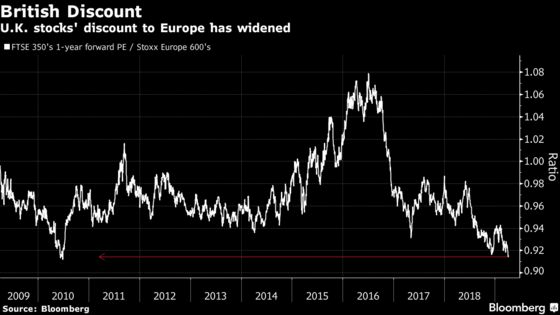 British stocks’ discount to European shares has once again slid to the lowest since mid-2017. 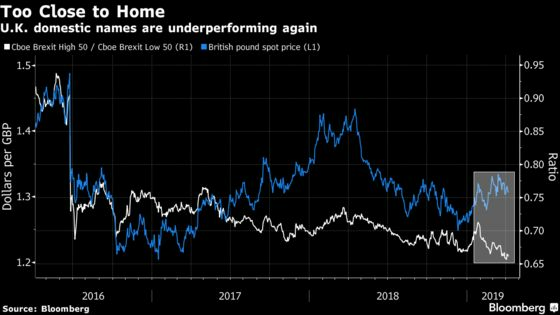 Within the U.K. market, a Cboe Index of stocks with the highest pound exposure has fallen to near the lowest versus the opposite category since at least 2016. Even funds used to investing based on mathematical models are getting spooked. CPR Asset Management is taking profits and boosting cash ahead of April 12, head of quantitative investing Cyrille Collet said in an interview on April 2. Where some investors see risks, others see opportunities. U.K. domestic stocks’ recent pullback is another chance to add to them, Barclays Plc strategists led by Emmanuel Cau argued in a note this week. Arbuthnot Latham, a 186-year-old British private bank, is also sensing the allure of U.K. assets after being underweight for a while. 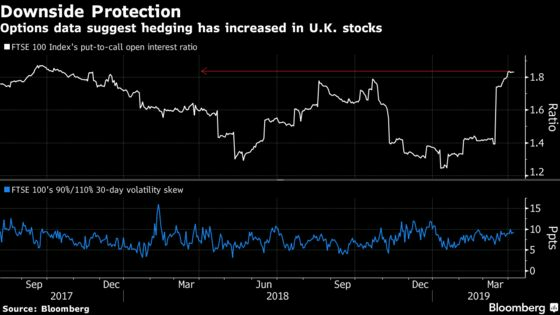 Hedging via FTSE 100 options has increased, as seen in the jump in the ratio of bearish bets to bullish ones. At the same time, the skew, or the cost of puts relative to calls, has remained muted, suggesting that investors could also be taking advantage of cheap downside protection. 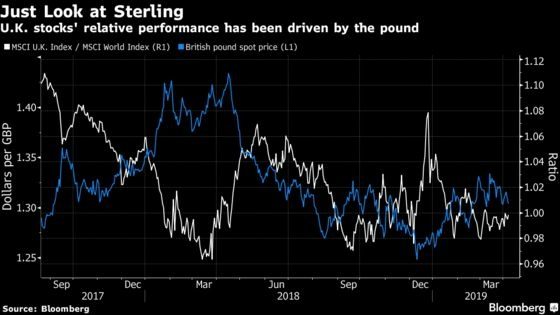 Of course, hedging with FTSE 100 options isn’t so straightforward, since bad news for the U.K. can often boost the large-cap index, which has an inverse relationship with the pound. Still, one thing’s clear: given how binary the Brexit outcomes are, market reactions will also be extreme, and even that steady FTSE 100-pound negative link may not hold. If there’s a delay, markets would prefer a second referendum to a general election, since the latter would lead to greater uncertainty. Meanwhile, May has also started talks with the opposition Labour Party in the hope of winning more support for her deal.